a strange duality exists in the work of italian sculptor edoardo tresoldi; that of the seen and the unseen. 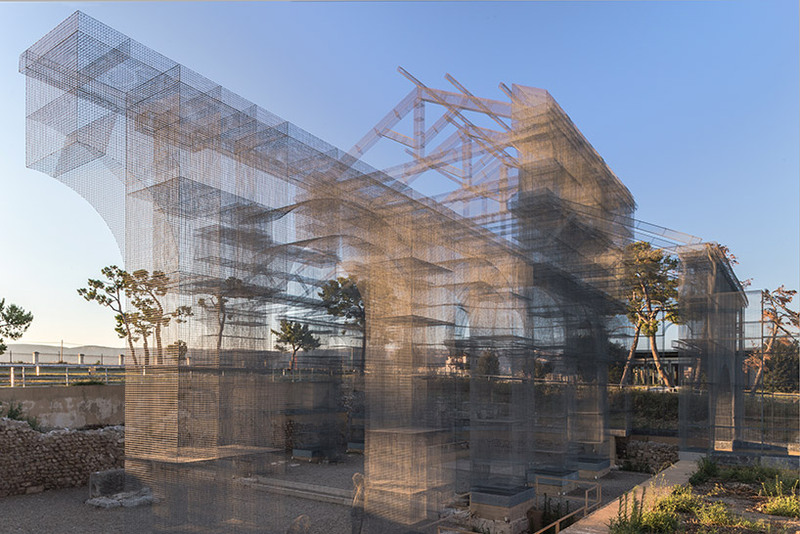 created from wire mesh, tresoldi’s work reveals and celebrates both of these perspectives at once, and offers the viewer snatched glimpses at a world existing between the two. similar relationships can be found throughout edoardo tresoldi’s body of work: that of the industrial and the poetic, the temporary and the permanent, or the classical and the contemporary. it’s a litany of juxtapositions that’s difficult to avoid when even the mesh itself seems to hover between one dimension and another. 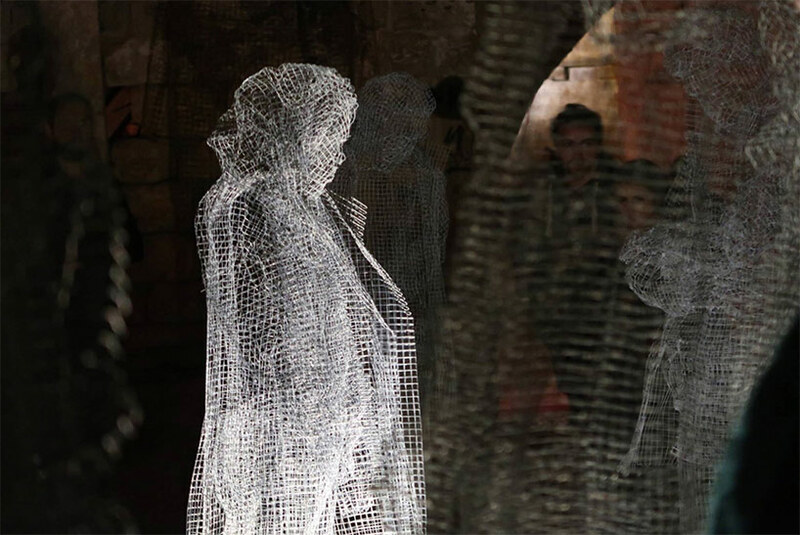 one might assume metal wire to be a difficult, unwieldy material—for keeping things out or trapping them inside—but in the hands of tresoldi it becomes one of storytelling, lightness, and romantic suggestion. its inherent contradictions are exactly what makes it so appealing and so effective at expressing the intangible. in doing so, tresoldi’s sculptures seem to consolidate bodies and structures which would otherwise remain unseen; capturing the poetry of an absent thing. 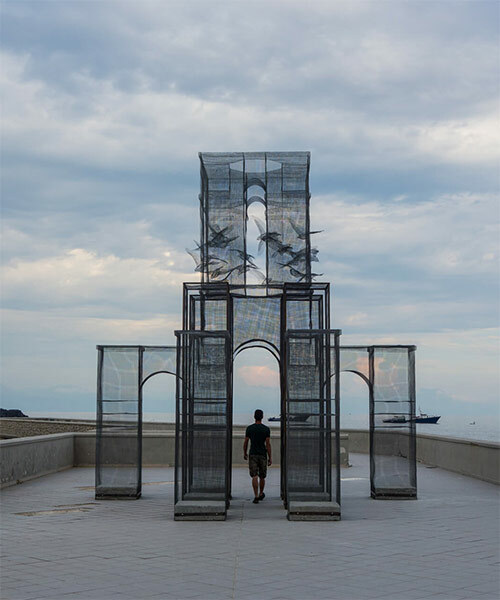 originally from milan, tresoldi has been creating interventions in the public space since 2013, creating site responsive pieces for music and art festivals, group showings, and public events. 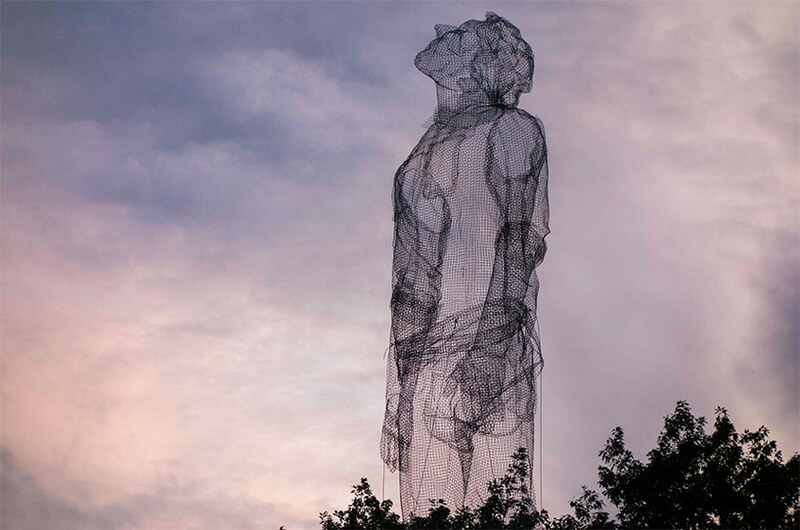 ethereal, arresting and intangibly beautiful, his sculptures offer new perspectives on form, framework, and the fragile balance of the world around us. some standout works inlcude ‘aura’, a two-part floating installation that took over the halls of le bon marché in september 2017; ‘locus’ a floating boat sculpture presented as part of the derive music festival in sapri; and the ‘basilica di siponto’, which resurrected and reimagined the architectural remains of a 13th century chapel in puglia, italy. in january 2017, tresoldi was included in forbes magazine’s 30 most influential european artists under 30.
designboom: can you tell us a little bit about your journey as an artist; when you started out and how you initially began making work? edoardo tresoldi: my artistic journey started with painting: as a child I spent some years under the guidance of milanese painter mario straforini. when I moved to rome to work in scenography, sculpture, and cinema, I used a vast number of mediums and techniques. they became a stimulating platform for experimentation, essential for the following developments in my research. 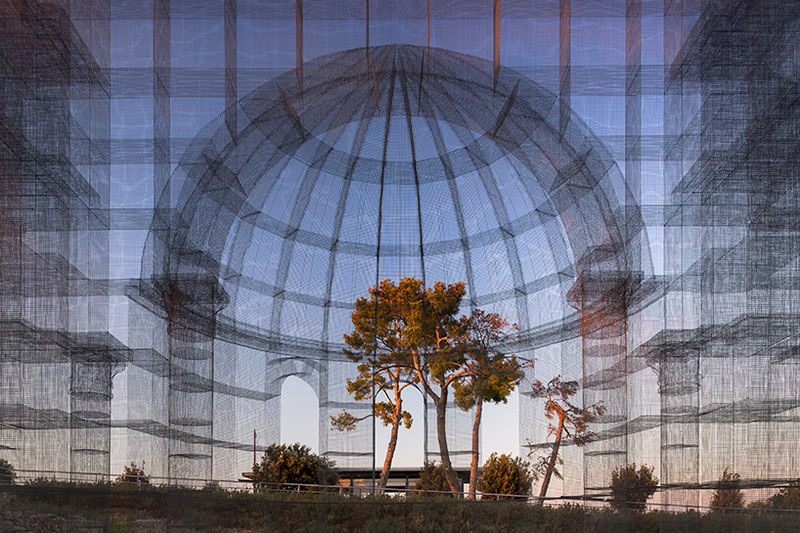 DB: how did you first start working with wire mesh? ET: back in the days when I was a scenographer, I made use of wire mesh to build the structures of set designs. I started to think about its own poetics dimension, so intimate and imaginative, and little by little it became an artistic research fully-evolved in an independent career also thanks to the incitements of the spanish artist gonzalo borondo, one of my closest friends. we have just worked together on matière noire, his biggest exhibition to date in marseille, in which I had the double role of artist and co-producer. DB: ​what initially drew you to the material and how does it compare to other mediums that you have worked in? ET: its lightness and the capability to tell the absence of matter, the immaterial side of things. I see in wire mesh poetics the depiction of a mental projection or, when related to history, the representation of what used to exist but is no longer there. 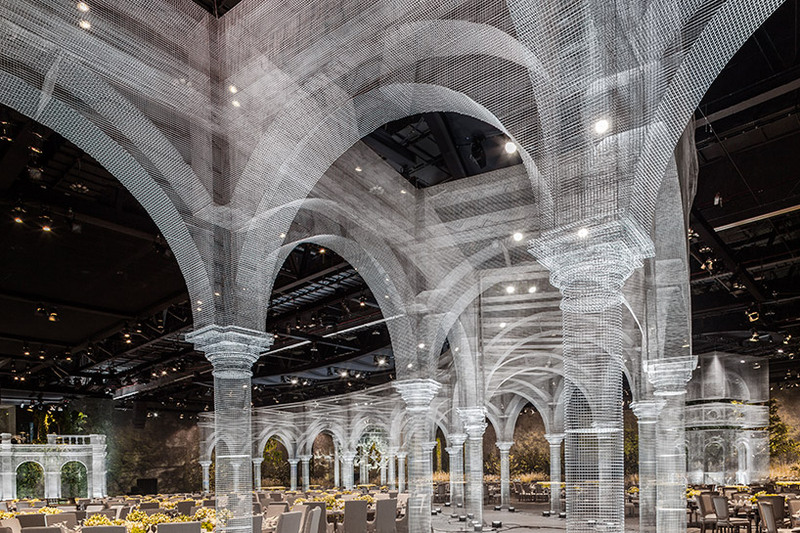 through transparency I’m also able to keep a direct link with the environment and to establish a new kind of immersive experience for visitors. currently, I’m experimenting several industrial materials that I intend to use in my next works. 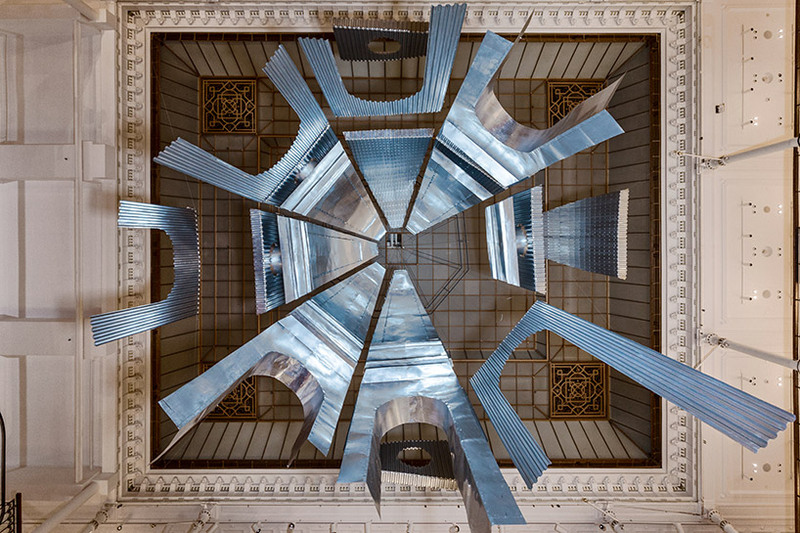 in aura, the site-specific installation realized in paris in september, I made use of corrugated metal for the first time. DB: how do most of your projects come about? are they generally commissioned pieces or do you seek out certain projects, and how much agency do you have over the finished piece? ET: some works, i.e. the basilica of siponto, converge with my research about the relationship with landscape and the study of its elements. others, such as ‘archetipo’ and ‘aura’, are its indoor variations: the first one is an absolute garden, a synthesis of nature and architecture in relationship with man, while in the second the connection between man and architecture is unveiled through the imperfection and the decomposition of matter. but I always confront my interventions with various disciplines, in order to contextualize them in different locations. they are all realized by me together with a team of professionals formed in my studio. fully handcrafted, they are the result of a personal technique developed over the years. DB: can you talk us through creating one of your sculptures, from inception to realization, and what physical or mental challenges this entails? ET: I deeply feel the charm of places and I recognize their expressive potential. my main interest is the relationship between the different elements of the landscape and how contemporary languages dialogue with each other, building its emotional structure. I always spend the right time studying and understanding the characteristics of the site, which become constituent parts of the work. DB: tell us about your most recent work, ‘aura’. 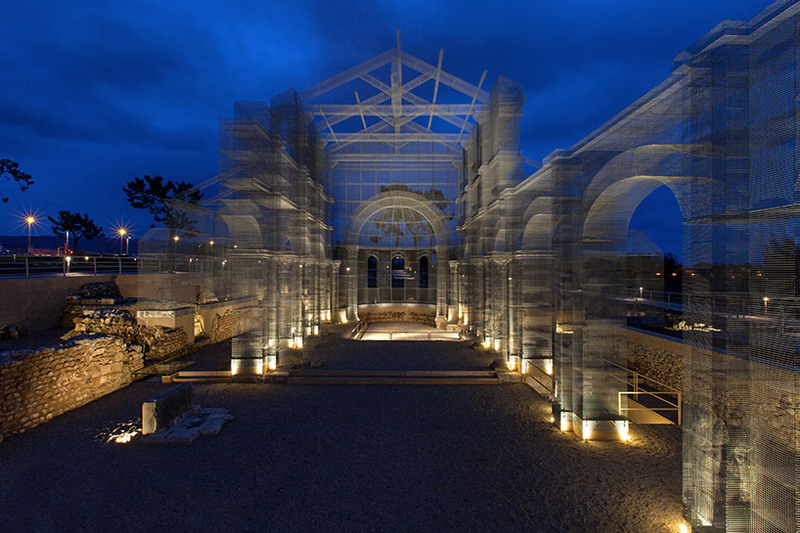 ​ET: ‘aura’ is a reflection on ruins and the transformation of architecture, with an emphasis placed on the contrast between classical forms and contemporary materials. it is composed of two majestic architectures with almost identical shapes but different references, materials and physicalities. they symbolize matter and non-matter, full and empty space, body and soul of architecture. 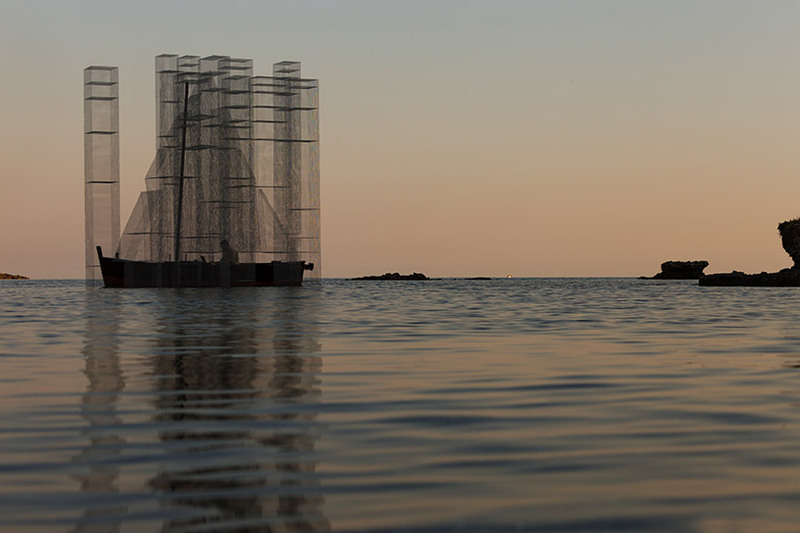 the one in wire mesh relates to the idea of absence, while the one in corrugated metal expresses the terrestrial dimension and the passing of time. I am very proud to have exhibited it within a fundraising event in london at the end of november to support the elton john AIDS foundation. DB: when reading about your work, two words that keep popping up are ‘language’ and ‘storytelling’. what do these words mean to you in terms of your sculptures? ET: as a contemporary artist, I intercept contemporary expressions and try to codify them. my aim is to narrate suspended histories and build an imaginary made of present day issues, telling themes not through their own languages, but by letting my creative process be contaminated. 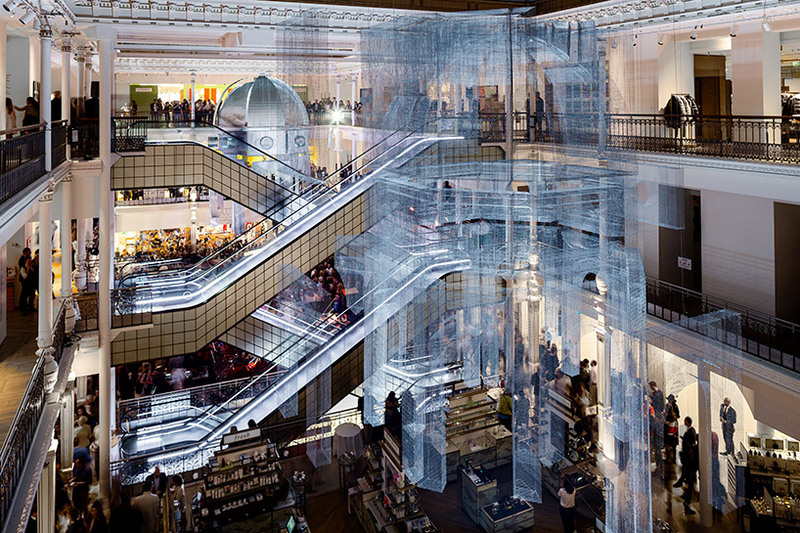 DB: how does your process change—if at all—when creating temporary pieces as opposed to permanent installations? ET: it depends on the story that I would tell and the dialogue established with the given context. 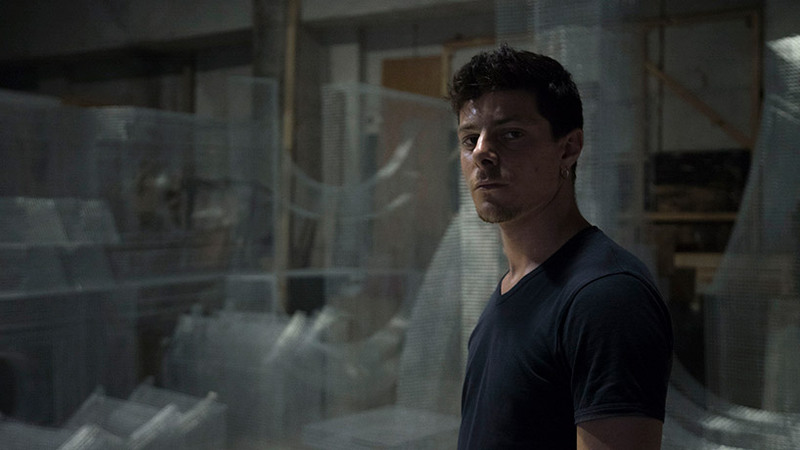 ‘locus’, for example, was born to host italian musician iosonouncane’s composition for derive festival in sapri, southern italy. it was an audio-visual performance closely linked to the sea and the natural elements. in this case, the bay of sapri has become one of the defining elements of a one-time event and acquired a temporal and performative value. ‘locus’ was a temporary creature: once its life cycle was completed, it disappeared, leaving the place to its pre-existing equilibrium. ET: my heterogeneous approach is in constant research of various influences and stimula. there are so many artists that I admire, but if I have to list a few names, they range from italian engineer pierluigi nervi and his pioneering experimentations on new materials to christo’s works of land art, from gregory crewdson’s suspended atmospheres up to manipulated matter in anselm kiefer’s poetics. DB: do you have anything planned for the future that you would like to share with us? ​ET: I’m opening my headquarter in milan, a space where I will be able to develop the different practices of my work: the focus on the relationship with landscape, the design department, but also experimenting new materials and start new collaborations, including those with musicians. DB: do you have a personal motto or words of wisdom you try to live by? ET: I think art is able to generate any kind of story; to narrate the world’s poetics. it’s a space where logic is allowed to abstract itself, the only one with the strength of a telling dream.